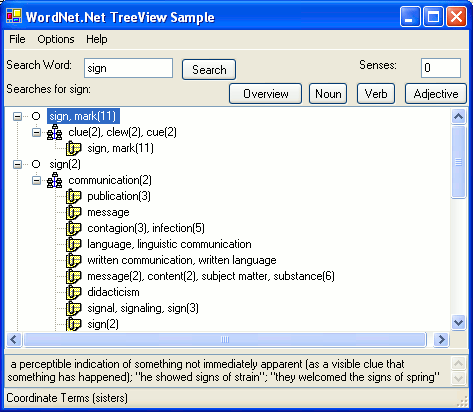 Welcome to the home page for the WordNet.Net library - the .Net Framework library for WordNet. The initial source release was on 6 June 2005. This library is maintained and managed by Troy Simpson. Malcolm Crowe is the author of the legacy library code which is now superceded by several WordNet database versions and library enhancements/bug fixes. Note that references vary, but ALL references that refer to this site or have used the library called WordNet.Net from 2005 onward is my rewrite of Malcolm's original work and therefore is relevant to this site and can be attributed to both Malcolm and myself. A number of publishers have taken my work without proper referencing.